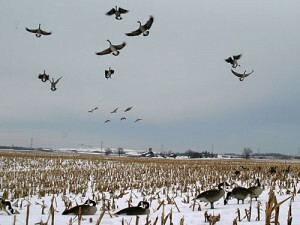 Canada geese cupped and committed. Well the south/central opener at Carlyle Lake came without much hoopla. Yes there were a lot of shots fired on the lake and surrounding impoundments, but not as many as in years past. With the limited food in the walk-ins resulted in a lot less shots being fired as in years past on the opener. Most of the birds in the area and have been since the October fronts came through are teal, primarily GW and woodrows and smileys, the mallards weren’t there in great numbers yet, but hoping mother nature to blow a few down here next time she checks her calendar and realizes it is November, by the way it was 63 degrees here this afternoon. Our friends to the north in the Illinois and Mississippi river areas have been feasting on small ducks as well but are enjoying a better mallard population. We ended up with 38 birds today mostly teal, shovelers and woodrows, with a few mallards and pintails sprinkled in, but not what you would expect on an opener as far as big ducks are concerned. It is early, it is Novemeber, and mild pretty much everywhere, good thing about there are 59 days left to get the 2015-201 season figured out…..takem. Kevin, thx for the report. Recently moved to the area and hunted Carlyle last season for the first time. What is your best guess as far as the crop plantings are like from last year to this year (%). I live an 1 1/2hrs away and was hoping to get an idea. Keep, it is pretty bad as far as the crops in the impoundments, with the heavy rain we had in June the water levels remained high and decided not to release the excess water therefore most of the area was not drained for planting. I have talked to several groups and there is some millet in the areas but not much for corn and other ag food. Opening weekend did produce some duck being harvested but I believe most of the birds taken were a result of coming back to that area to rest and dabble. I will update when the mallards start to show up in better numbers, I think you can do alright in those areas once the bulk of the large ducks show-up. A nice cold front is going to hit later this week and temps will be more November like from the weekend on, once we get rid of this monsoon we are currently getting hammered with, good luck.